The word collage derives from the French word, colle, which means paste or glue. 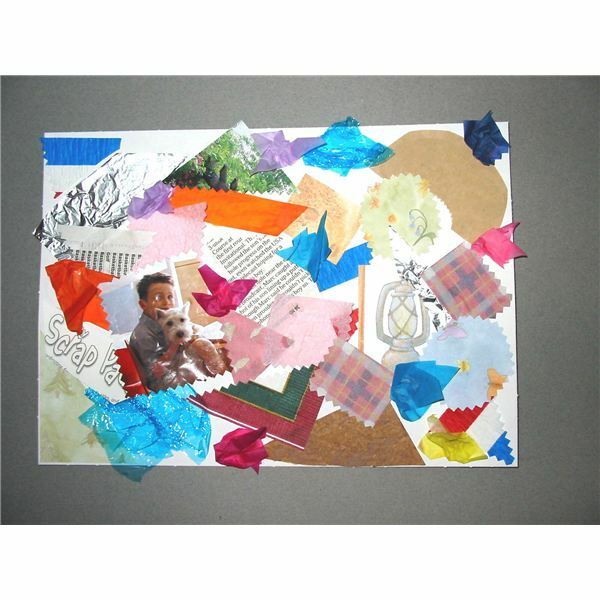 Collage is a flexible and forgiving art form that appeals to children of all ages. Preschoolers need three separate skills in order to make a collage: ripping, cutting, and gluing. These skills are "process oriented" art skills and the child’s final product is often just the parts of that process. Children should be encouraged and praised not only for the final products but also for their progress in handling scissors, coordination in ripping, and the ability to use glue. It’s always nice to receive donations for materials that can be used in collage making. Set up a bin near your front door and ask parents to send in recycled materials from home. You may wish to post a list of things needed. For example, paper can include gift wrap, wallpaper scraps, greeting cards, tissue paper, cardboard, aluminum foil, plastic wrap, and so on. Collage materials can also include fabric scraps, string, yarn, Styrofoam pieces, bubble wrap, pictures from magazines or photos, and ribbons. Anything that can be easily glued onto paper will work. This project makes use of paper scraps while helping children learn about the shades of different colors and developing sorting skills. Gather a variety of light and dark colored collage materials. Invite the children to sort the items into two groups: light and dark. Help them to decide where to put the first few items according to which collage they choose to do. To extend this lesson, notice the children’s clothing and mention the light and dark colors in what they are wearing. Pick up a variety of free paint chips from your local hardware or paint store and introduce the children to a neat way to making a collage. Help the children cut shapes from the paint chips. Choose geometric shapes like squares, circles, diamonds, and triangles. Show the children how to use a glue stick on the back of each shape and paste them down on the paper to create a design or picture. Demonstrate to children that smooth foil can reflect things such as the sun. Tell the children to keep the foil smooth and carefully glue the shapes anywhere all over the cardboard. Have the children take the completed foil collage outdoors and stand next to a wall. Let the sun reflect off their collages and onto the wall to make different designs. The use of recycled materials is a wonderful way to teach repurposing and staying ‘green’ in the classroom. Help children begin a collage project based on the theme or your choice or theirs and watch the students become creative and excited at the same time. Here are a few suggested picture books to show the children where collage has been used in the illustrations.